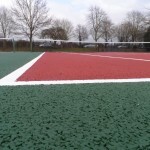 Macadam tennis courts are commonly installed in the UK for leisure centres, clubs and schools as they provide a durable and long lasting surface for a variety of different activities as well as tennis. 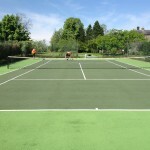 As these facilities are often heavily used as multi purpose areas with tennis, basketball and netball, they can become worn out over time if they are not maintained properly, this could lead to a tennis court binder coat needing to be applied. 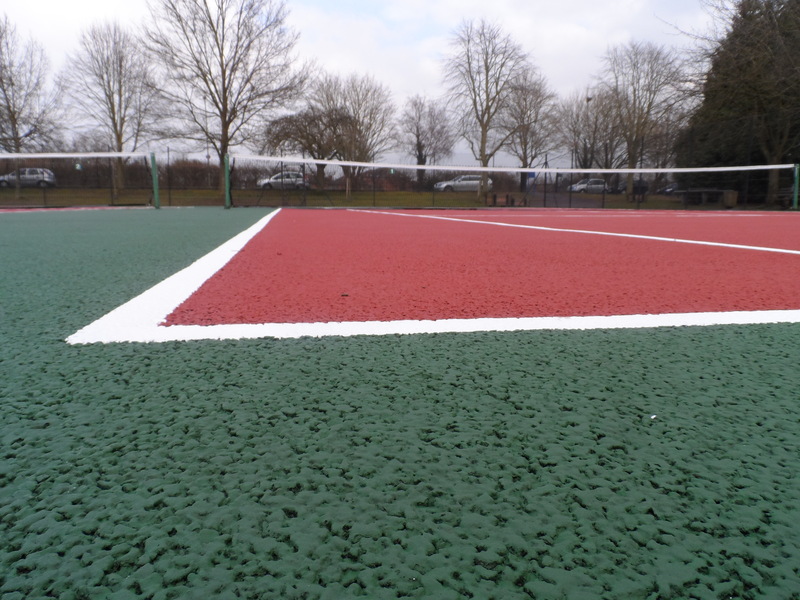 Having this specialist macadam binder coating sprayed onto the court can improve both the appearance and the playing qualities of a tired and worn out sports court. We are able to apply this to existing courts, or as part of a full construction project, so don’t hesitate to get in touch with us for more details. When a tennis court binder coat is applied to an existing macadam surface, it acts as a glue to bind all of the loose fretting pieces of stone together. 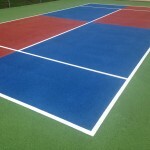 The specialist sports court binder provides excellent adhesion to the tired macadam, making the surface stronger and more durable so it can withstand heavy use with lot of different sports. 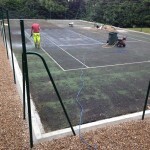 Applying a sprayed layer of the court binder will also give the surfacing a resistance to the growth of moss and algae which commonly occurs in damp conditions when the macadam flooring gets dirty. Carrying out regular tennis surface maintenance also helps with reducing these problems and keeps the facility looking its best. 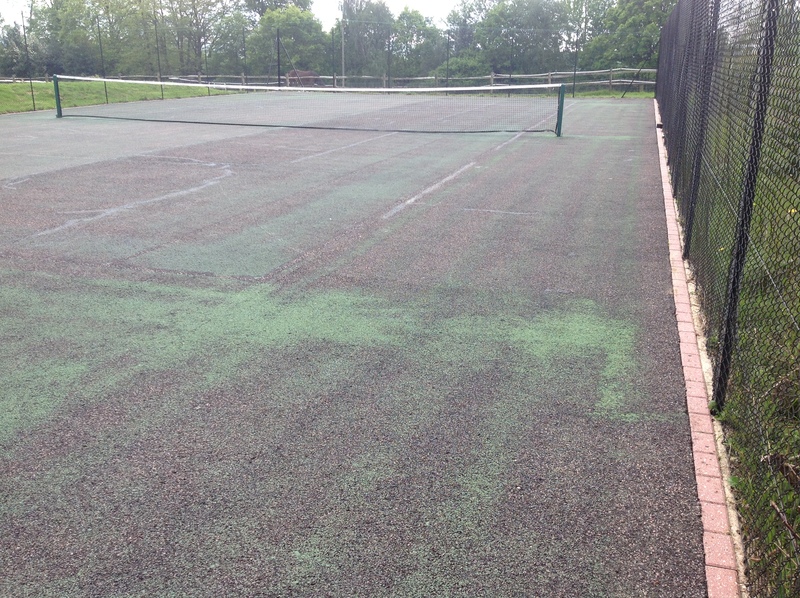 This is why a binder coat application is often done for new courts which are in shaded areas beneath trees as these surfaces can get damp easily and be prone to contaminations from leaves and other debris. 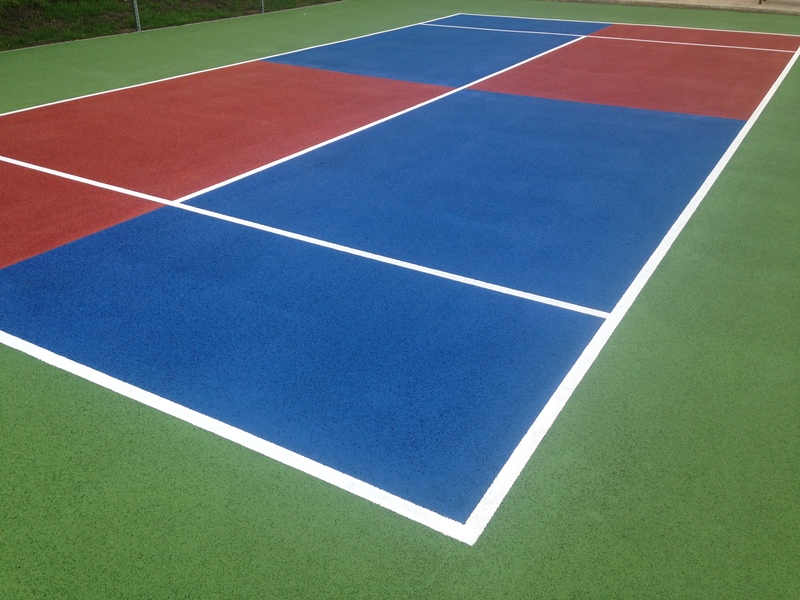 As well as protecting the macadam surface from contamination, the sports court binder coat application also provides an ideal base coat for a new layer of acrylic paint. The court binder will improve the appearance of the new tennis court painting as well as making it last longer and enhancing the anti slip qualities it provides. Unfortunately court binder can’t be applied on its own and a new coating of acrylic paint will always be needed in conjunction with the application of a tennis court binder coat. 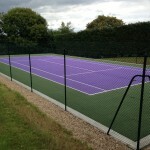 Acrylic sport court paint can come in a range of bright colours which can be applied in bespoke designs with line markings for a number of activities. The anti slip properties of this specialist sports paint can come in a range of levels depending on the primary sport which is going to be played. 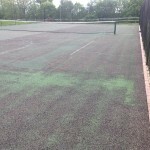 For example if the court is predominantly used for tennis a lower anti slip rating would be needed compared with a court which is mostly used for netball. 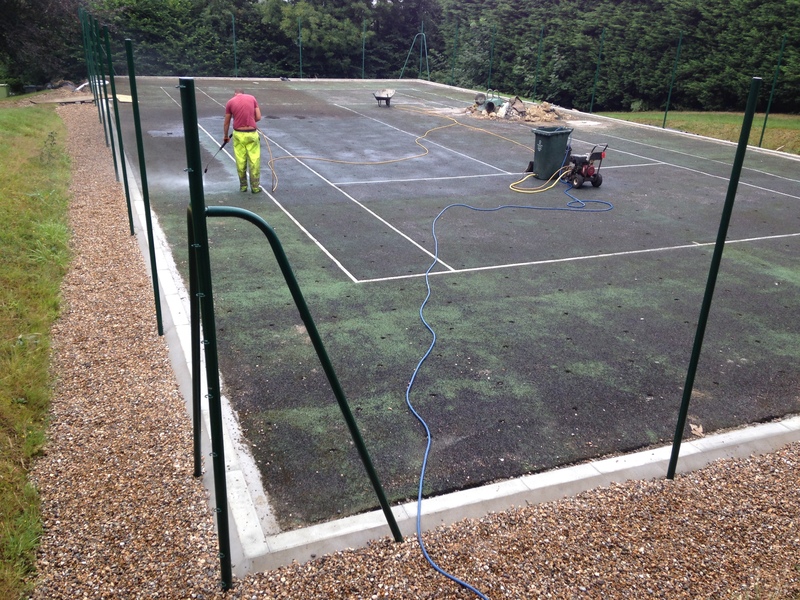 Before applying a binder coating and fresh paint layer, it’s vital to thoroughly clean the surface of the court with a pressure washer and specialist cleaning solution. This is to make sure that no dirt or debris is left on the court surfacing prior to applying the binder and paint coatings. 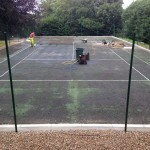 If thorough tennis court cleaning is not carried out, pieces of dirt and loose stones can get stuck under the coating, and when these are lifted away the paint will come off and look patchy as it won’t have stuck to the court surface itself. 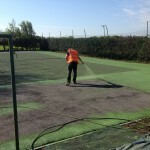 It’s always important to do regular tennis surface cleaning for any outdoor court to ensure that it doesn’t get damaged or become worn out from heavy regular use. Maintenance such as brushing, pressure washing and reapplying anti slip paint will keep the surface in top condition and make sure it’s safe for players. If you have a macadam tennis court which has started to develop fretting or cracks, it might be in need of a tennis court binder coat and fresh layer of acrylic paint. Please get in touch with us through our contact form and we’d be happy to discuss this with you in more detail. Send us over the area size, site location and a brief description of the work which needs to be carried out and we’ll give you a price quotation for the project. We have completed many projects throughout the UK so we’d be glad to offer a price for whatever you need. Just give us an idea of your budget so we can make it as cost effective as possible.